WASHINGTON (June 07, 2016) -- The Army's 241st birthday is but a week away now, and Army leaders are saying of Soldiers "let them eat cake" ... but only if they're going to burn off the calories with some robust physical training. During Army birthday week, senior Army leadership encourages Soldiers to share on social media the physical training activities they do to burn off the calories they'll consume from eating Army birthday cake. Soldiers can share their workout clips via social media at Twitter #EarnYourCake and #USArmy, and also on Facebook at www.facebook.com/USArmy. They can learn more about the campaign at www.army.mil/Birthday. "Everybody loves cake," Murphy said. "But you have to get after it physically, so you aren't packing on the pounds. 'Earn Your Cake' is something we are pushing out there to make sure people know that while we are going to take time to celebrate on our Army birthday, that doesn't preclude the fact you have to earn it. You have to get after it every morning, before the sun rises, and push yourself so you are physically fit, so that you are a warrior and ready to answer the call against our enemies." Dailey echoed Murphy's sentiment, saying "a day in the Army without PT is like a birthday without cake." Soldiers can share their workout clips via social media at Twitter #EarnYourCake and #USArmy, and also on Facebook at www.facebook.com/USArmy. They can learn more about the campaign at www.army.mil/Birthday. "The campaign is a great way to show Americans our commitment to being fit to fight tonight, if they need us," Dailey said. Both Murphy and Dailey claim the upper hand when it comes to who'll do better at earning and burning the calories in the big slabs of sponge and buttercream frosting they'll consume at the multiple cake cuttings held in the D.C. area for the Army's birthday. Already this month, the undersecretary nabbed a swipe of frosting off the sword used to cut a cake in honor of the 100th anniversary of the ROTC program. That wasn't even part of the Army birthday. Whether he later had an actual piece of that cake is unknown. There will be an Army birthday cake on Capitol Hill, June 15, and one at the Pentagon, June 16. 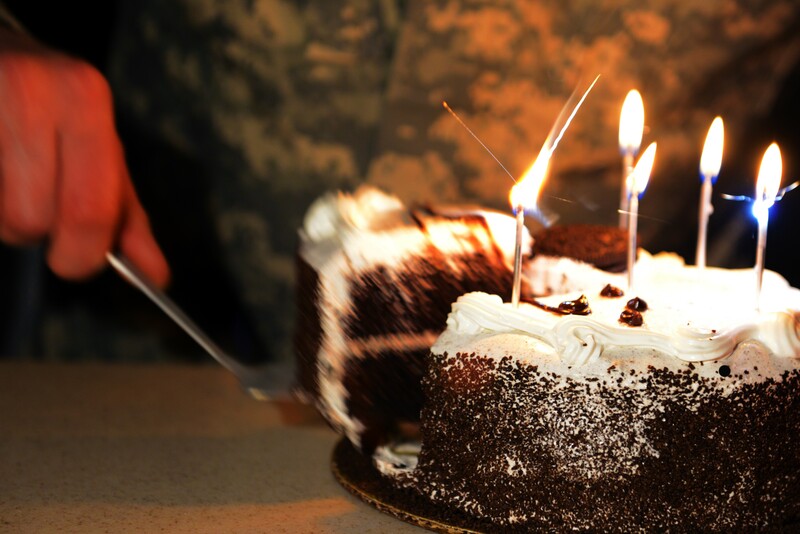 There will also be cake involved during Army birthday-related events in Philadelphia as well, after Murphy and the Dailey conduct a demanding PT routine alongside Soldiers of the Pennsylvania National Guard and celebrity Chef Robert Irvine the morning of the Army birthday -- June 14. While in Philadelphia -- the birthplace of America's Army -- Murphy and the SMA will also do some rappelling down the side of a downtown building. Videos of that can be expected to make the rounds on social media shortly afterward. Murphy said he's got a lock on PT the SMA can't hope to touch. "We need the SMA to still drink milk, take his vitamins, keep working hard," Murphy said of Dailey. "And then someday he might be able to be a champion like myself. But, you know, I definitely, no doubt, have bigger arms than he does. But, you know, I think he might run a little faster than me, so it's going to be a good competition going into the Army birthday." He said he's also got the inside scoop on Dailey's plans to undercut his PT prowess with social media trash talk. "I was in the intelligence community for a long time when I was a U.S. congressman," Murphy said. "And my intel sources are telling me the SMA is about to talk some smack on social media to me. So we will see. And we will respond in kind. But, you know, I follow the Powell Doctrine. We all have a clear mission. I use overwhelming force to accomplish that mission. And I have an exit strategy. My mission will be that, you know, let SMA know that I'm the man. And to be the man you have to beat the man -- to quote the great Ric Flair." Dailey said of Murphy that he doesn't stand a chance of out-PTing him. "I heard USA Murphy says he's going to use overwhelming force to beat me at PT," Dailey said. "He's going to need overwhelming force to wake up before 9 a.m. We in the Army have a saying: we do more before 9 a.m. than most people do all day. And we've been doing it for 241 years. This reminds me of my favorite quote from the late, great, Muhammad Ali: 'If you even dream of beating me you'd better wake up and apologize.'" Murphy said PT, like sleep and nutrition -- all three parts of the Performance Triad -- are part of the individual readiness that ensures the Army is ready to fight the nation's wars when called upon to do so. "We need to make sure that on an individual basis, every Soldier is ready to fight tonight," Murphy said. Murphey said it's very important for each member of the team to make themselves as ready as possible for the next mission, but the unit and Army overall must prioritize readiness every day. During the Army birthday week, Murphy said he hopes that Americans recognize that their Army is "America's varsity team." "We're the ones that answer the call from the president of the United States, or a governor, to answer our national challenges," Murphy said. "These young men and women who join our ranks are the best that America has to offer." And for Soldiers, he said, he wants them to remember just how far the Army has come in 241 years. "This gives us a chance to reflect on our history," Murphy said. "But also, to re-dedicate ourselves to be the best professional fighting force this world has ever seen, and we owe it to the next generation to make our Army even better."